For over 40 years Endeavour Plumbing has been servicing the residents of Malvern East with all of their plumbing needs and requirements. Mishaps with plumbing appliances are among the most common, being that they are the most often used in households and work environments. We are able to take care of it all. Throughout our years in the industry, we have provided services to a wide array of clients of both residential, commercial, and corporate backgrounds. 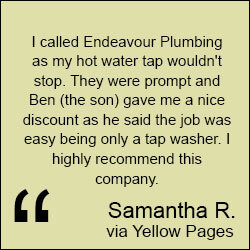 One of the reasons why Endeavour Plumbing continues to be one of the most trusted plumbing services in Malvern East is our incomparable customer service. Along with giving our customers remarkable plumbing solutions, we make every effort to be regarded as a company that you can rely on and trust whenever needed. Professionalism from start to finish is one of our priorities; we always communicate all aspects of the job to our clients, ensuring that they are aware of all of the techniques involved with repairing their plumbing systems. Our extensive knowledge in the industry reassures you that we are the go-to plumbing company. Whenever Malvern East Needs Us. Due to the fact that plumbing emergencies most often occur at inconvenient of times, we have our plumbing experts working around the clock, so that no matter the place or time, you will not have to worry about having your appliances fixed in a moment’s notice. We thoroughly examine the problem or task prior to commencing work, and then proceed to employ the best method to fix it as efficiently and effectively as possible. We offer quality service at competitive yet affordable prices.If you are in need of plumbing services in Malvern East, contact us through our website or give us a call to schedule an appointment! We also provide plumbing services in Metro and surrounding suburbs such as our plumbing services in Wheelers hill, if you're looking for the quickest service speak to our expert plumbers today.